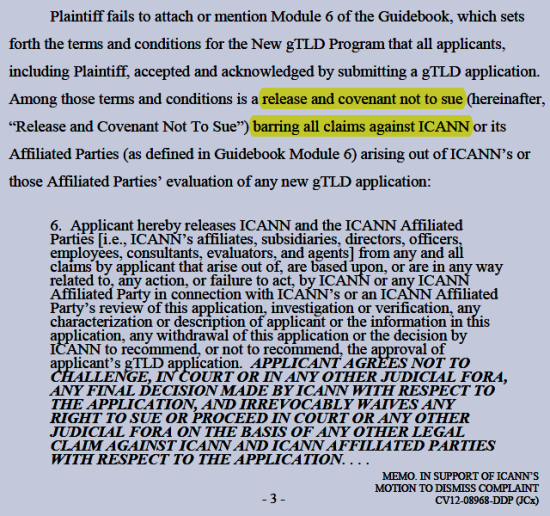 Key to the case was the application of California state law (a California statute invalidating "Covenants Not to Sue" or "Releases"), to ICANN in connection with new gTLD applicants. Specifically, the U.S. District Court case involves Plaintiff DotConnectAfrica Trust (DCA Trust), a Mauritius Charitable Trust, applicant for new gTLD .AFRICA, and Defendants ICANN (Internet Corporation for Assigned Names and Numbers), a California corporation, and ZA Central Registry, a South African non-profit company. If this all sounds like a confusing mix of global internet governance with California state law and jurisdiction and U.S. federal law and jurisdiction (U.S. District Court), welcome to the world of ICANN and the legal system of the United States of America, see Erie doctrine (Wikipedia). "All contracts which have for their object, directly or indirectly, to exempt any one from responsibility for his own fraud, or willful injury to the person or property of another, or violation of law, whether willful or negligent, are against the policy of the law." "On its face, the Release is “against the policy of the law” because it exempts ICANN from any and all claims arising out of the application process, even those arising from fraudulent or willful conduct. Cal. Civ. Code § 1668. ICANN argues that Section 1668 is limited only to agreements involving the public interest which the Guidebook is not, and cites to Tunkl v. Regents of Cal., 383 P.2d 441 (Cal. 1963) for support. However, Tunkl concerns the validity of a release from liability for negligence, not intentional acts or fraud. Here, the Release waives all liability, not just liability resulting from negligence. Thus, Tunkl is distinguishable, and the Court need not determine whether the Release is in an agreement involving the public interest ... ICANN fails to recognize that the alleged conduct giving rise to this claim is intentional. Specifically, DCA alleges that ICANN intended to deny DCA’s application after the IRP proceeding under any pretext and without a legitimate reason ... The evidence suggests that ICANN intended to deny DCA’s application based on pretext. Defendants have not introduced any controverting facts. As such, the Court finds serious questions regarding the enforceability of the Release due to California Civil Code § 1668 .... the public has an interest in the fair and transparent application process that grants gTLD rights. ICANN regulates the internet – a global system that dramatically impacts daily life in today’s society. The IRP Declaration recognizes that ICANN’s function is “special, unique, and publicly important” and ICANN itself “is the steward of a highly valuable and important international resources ... the Court finds that both the likelihood of irreparable injury and the public interest favors the injunction ..." (emphasis added). There is nothing any Court, including a U.S. District Court, can do about this, other than dismiss all cases filed by parties claiming otherwise. In such cases, the United States District Court for the Central District of California, at Los Angeles, serves as a judicial forum to provide remedies, legal and equitable, for injured parties. "When a decision is taken about a possible new top-level domain, ICANN's job is to work out, in a transparent and accountable manner, whether it is really in the best interest of the world as a whole, not just of those launching the new domain." Sir Tim is referring to the public interest. Judge Klausner apparently agrees, there is a public interest involved. "Plaintiff [DotConnectAfrica Trust] asserts “[i]t [the Release or Covenant Not To Sue] cannot mean that ICANN can decide to reject a qualified applicant for any reason whatsoever.” (Opp’n at 16: 24- 26.) However, that is exactly what the contract term means. Thor Seafood Corp. v. Supply Management Services, 352 F.Supp.2d 1128, 1131 (2005) ...."--ICANN's Amended Reply Memorandum (pdf) filed April 14, 2016, in support of ICANN's Motion to Dismiss DCA Trust's First Amended Complaint in its entirety, with prejudice, set for hearing on April 25 (emphasis added). Of course, all of this bears on the touchy subject of ICANN's future jurisdiction, which was deferred to Work Stream 2 (WS2) of the CCWG-Accountability process, for political reasons--foreign and domestic--Congress would not otherwise approve an IANA transition that changed ICANN's jurisdiction, and others outside the U.S. are adamant that ICANN should be located in a neutral jurisdiction such as Switzerland. Jurisdiction is not a fundamental bylaw under the proposed new bylaws, and theoretically ICANN could change its jurisdiction at any time in the future after the transition is complete and the Affirmation of Committments (see paragraph 8), is no longer in effect. However, this decision to defer the threshhold issue of jurisdiction has only contributed to the dysfunction of the overall CCWG-Accountability WS1 process--all of the new proposed bylaws are drafted in accordance with, and dependent upon, ICANN's jurisdiction remaining in California. ICANN has tried to "play both sides of the fence" on the jurisdiction issue--telling Congress (under oath), ICANN will stay in the U.S., and telling, e.g., the French Senate, that ICANN is moving forward with plans to create a “parallel, legal, international structure, maybe in Switzerland, for ICANN,”--see Fadi Chehadé, Will ICANN Move to Switzerland? | DomainMondo.com and Will ICANN Board Disclose New Swiss Legal Structure at ICANN 50 London? | DomainMondo.com. Wonder why people don't trust ICANN? • Calls with Community on Public Comments Submitted on ICANN's Draft FY17 Operating Plan and Budget - Finance Community Wiki: ICANN will be holding community calls during which the comments submitted on the Draft FY17 Operating Plan and Budget will be presented by the submitters to ICANN staff. According to ICANN, this is intended to enhance the understanding of the comments and so improve the quality of the response. The schedule for these calls will be published as dates and times are agreed with each constituency group, more info here. • In the world of tech, the Yahoo ($YHOO) bid deadline is Monday, April 18, 2016. Yahoo's Q1 2016 earnings release is Tuesday, April 19, after market close. Google n/k/a Alphabet ($GOOGL, $GOOG) will be reporting Q1 2016 earnings Thursday, April 21, after market close [corrected to delete reference to Amazon which will report April 28]. • In Washington this week, venture capital firm Andreessen Horowitz is hosting a summit on Tuesday and Wednesday (media not invited), which will feature Speaker Paul Ryan (R-Wis.), interviewed by a16z.com co-founder partner, Marc Andreessen. • On Tuesday, April 19, House Energy and Commerce Subcommittee on Oversight and Investigations will hold a hearing entitled, “Deciphering the Debate Over Encryption: Industry and Law Enforcement Perspectives.” Bruce Sewell, general counsel of Apple, and Amy Hess, the FBI's executive assistant director for Science and Technology, will be among those testifying. • On Friday, April 15, Neustar, Inc. (NYSE: NSR), a Top-Level Domain Name (.co, .us, .biz, etc.) Registry Operator and Registry Services provider, and technology company, announced that J. Beckwith (“Becky”) Burr, Deputy General Counsel and Chief Privacy Officer, has been elected by domain name industry registries and registrars, to serve on the ICANN Board of Directors, replacing Melbourne IT's Bruce Tonkin whose term expires November, 2016. Burr has been an effective advocate for the interests of Neustar, and the domain name industry generally, within ICANN, most recently as the Registry Stakeholder Group appointed member of the Cross Community Working Group on Enhancing ICANN Accountability (CCWG-Accountability). Like many lawyers-lobbyists-stakeholders active in ICANN, Burr not only has domain name industry ties, but is also a product of Washington, D.C.'s revolving door culture, having once served as Associate Administrator of NTIA, U.S. Department of Commerce, at the time of ICANN's formation in 1998, about which Domain Mondo may have an upcoming post. • ICANN ex-CEO Fadi Chehade's partner in his NETmundial schemes, Brazil's Presidenta Dilma Rousseff, faces an impeachment vote on Sunday, April 17, based on allegations of misappropriated funds from public banks to shore up the government’s finances as she faced a tough re-election in 2014, the same year as the NETmundial Conference in São Paulo, Brazil. Maybe she should have followed Fadi's example and just left voluntarily. Who knows, she might have gotten a big bonus and a grand $100,000+ "Tribute Party" in Marrakech, complete with camel selfies, like Fadi did! Finally, check out the Domain Mondo posts (including videos) this past Friday and Saturday on the IMF Spring Meetings in Washington, D.C. Note the IMF legal structure and compare it to ICANN's.